« Scans Daily No More? It was a relief to see French cartoonist Maurice Sinet — pen name Siné — acquitted of charges of “inciting racial hatred,” brought by The International League Against Racism and Anti-Semitism, at the court in Lyon earlier this week. Siné was fired from his long-time employer, the venerable French weekly satirical magazine Charlie Hebdo, last year, after having provocatively insinuated that President Sarkozy’s son was going to opportunistically convert to Judaism to marry the Jewish heiress of the hardware chain Darty. To the spectator, not privy to what went on behind the scenes, this and the subsequent charges of anti-semitism on the part of several colleagues as well as a number of prominent intellectuals seemed patently absurd. The short piece Siné wrote was provocative, sure, but that’s his freaking job as a satirist, and it could definitely be described as both dumb and in bad taste, but anti-Semitic? Please. For Charlie Hebdo editor Philippe Val, having just weathered the similarly absurd lawsuit brought against the paper for publishing the infamous Danish Muhammed cartoons, and supplying more of their own, to even put himself in this situation reflects badly upon him. I gather that there had long been disagreements between the two of them, and that Siné was controversial even amongst the paper’s employees, but that’s irrelevant in this situation. Val did not himself accuse Siné of anti-Semitism, preferring to describe his editorial as “improper,” but to solve professional differences by tacitly invoking greater principles and embroiling your employee in this kind of fracas is nevertheless disgraceful. This is not the way to combat the very real threat that is latent anti-Semitism in Europe, and it certainly is not the way to run a satirical newspaper. ActuaBD is a good analysis of the affair from last year, and also has a great resource section of it. 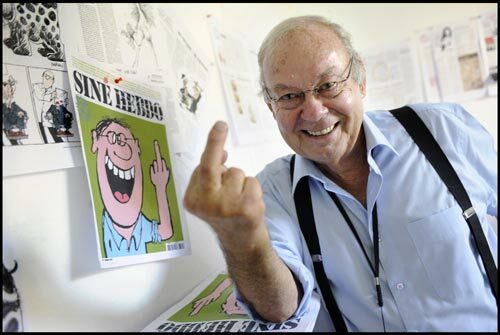 Here’s Siné’s blog, the the photo is from Siné Hebdo. Very good and sound summary of this case!